Other sounds associated with X_TRADER are also set on the Sounds tab. The TradeSounds dialog box controls what you hear when trade updates come from an exchange. They are completely configurable and can be set for up to five quantity levels. When enabled, the average price highlighting feature automatically displays the average open price short and long. Enabled by default. The average open price long highlights bold blue, while average open price short highlights bold red. Note: MD Trader average price rounds longs up and shorts down. Click to select the Display Average Price of Position option. You can create a User-Defined Price (UDP) column in MD Trader using the MD Advanced tab. This column appears to the left of the standard price column and can be set to show the Net Change, Price As Yield, Yield-To-Maturity, or a custom pricing model for a given contract. In the following example, the Net Change is shown in decimals. For help creating the User-Defined Price column, see the MD Advanced Tab. Note: When you enable both Price Consolidation (on the MD Display tab) and the Enable User-Defined Price Column (on the MD Advanced tab), the prices consolidate first. The consolidated price is then used to perform any calculations. Because the Display Yield-To-Maturity setting is based on an algorithm, N/A values can appear in the User-Defined Price column. This occurs when you set inaccurate values in the property’s parameters for a given contract. You can customize the preset order quantity buttons in MD Trader. These buttons are stored as part of a workspace. Right-click the Preset Order Quantity button. Type a value using the keyboard. Follow these procedures to display a smaller MD Trader. The Zoom and Market Explorer buttons do not automatically display in this smaller version of the window. This lets you view the product and contract in the MD Trader titlebar. If you want to view the titlebar buttons, go to the MD Display tab on the Properties menu and disable the Hide Titlebar Buttons property. Alternatively, you can use the Show/Hide Titlebar Buttons option on the context menu to show or hide the titlebar buttons for that particular MD Trader. MD Trader has a property in the MD Display tab that serves to keep the MD Trader always on top of other X_TRADER windows on the desktop. Click to select the Keep MD Trader on Top option. You can drag-and-drop the columns in MD Trader to a different locations in the grid. Click the top of the column you want to move. A box outline appears beneath the mouse pointer. Click a second time and hold the mouse button on the column you want to move. Move the column left or right to the desired position. A red line indicates where the column is moving. The column moves to its new location. If you make MD Trader a smaller size using the mouse, it does not display a horizontal scroll bar and your view of the depth is cut off on the right side. Right-click MD Trader to access the context menu and click Size to Fit. MD Trader expands to the proper size and removes the scroll bars. 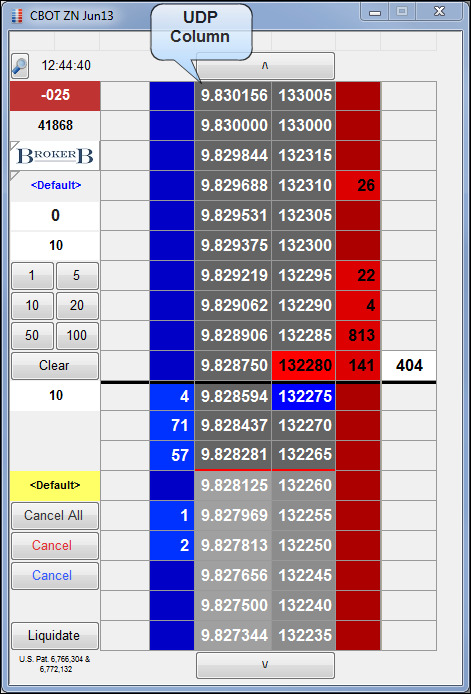 In MD Trader you must set a value in the Maximum order quantity property on the MD Trading tab before you trade. This quantity prevents you from entering an order larger than your limit. For example, if the maximum trade quantity is 50, you are not permitted to sweep the market with an order quantity of 300. Enabling Liquidate. For more information, refer to Liquidating a Position. In the Order Parameter section, type a maximum order quantity.